Most of us are probably familiar with award-winning grand lobby bar Atlas for its massive, towering gin collection that’s been the talk of the town. What some don’t quite realise is that its Champagne collection is similarly impressive. If you’ve been to the grandiose lobby of Parkview Square that ensconces Atlas, you would no doubt have witnessed the imposing centrepiece housing the bar’s comprehensive collection of over 1,100 gins. Aside from the instant Instagram-worthiness of the opulent Art Deco-style space, it’s what brings most people in to experience the all-day dining and drinking destination that’s landed a coveted spot in the World’s 50 Best Bars list earlier this year. Bartenders here will happily compose a gin-based cocktail for you using any of the juniper-based spirit they have on hand that you may prefer, and when what Atlas has is unequivocally the world’s largest collection of gin that is quite the choice to make. But what most people do not know – until they peruse of the drinks list, that is – is that tucked away beneath that massive gin-holding edifice in a small hidden cellar is a collection of Champagnes to behold. In fact, with more than 250 of the world’s most sought-after labels, the Atlas Champagne Collection is recognised as one of the largest of its kind in the whole of Asia. And that prestigious collection features some of the finest bubblies sourced directly from the finest wine maisons across the Champagne region encompassing both breadth and depth. Perhaps Atlas’ sprawling collection of Champagnes shouldn’t be too much of a surprise. After all, Atlas – and the entirety of Parkview Square – is the labour of love of Hong Kong-based, family-owned Parkview Group that’s owned by the Hwang family. The Hwangs are known for their love of fine wines, and have such an extensive selection of wines that their own collection – the Parkview Family Cellar – has an attendant sommelier and even a personal pilot on hand to fly to Champagne to purchase entire cases of wine direct from Champagne houses for personal consumption. Once in a while, Atlas head sommelier Mason Ng will work with Jack Cheung, the Hwang family’s personal sommelier, to acquire special bottles from the family’s own collection to help supplement Atlas’ range. The Champagne list at Atlas is so comprehensive it has to be divided into four distinct categories. La Sélection is a listing of the great diversity of Champagne, featuring both vintage and non-vintage Champagnes from the more familiar houses to a number of grower Champagnes. 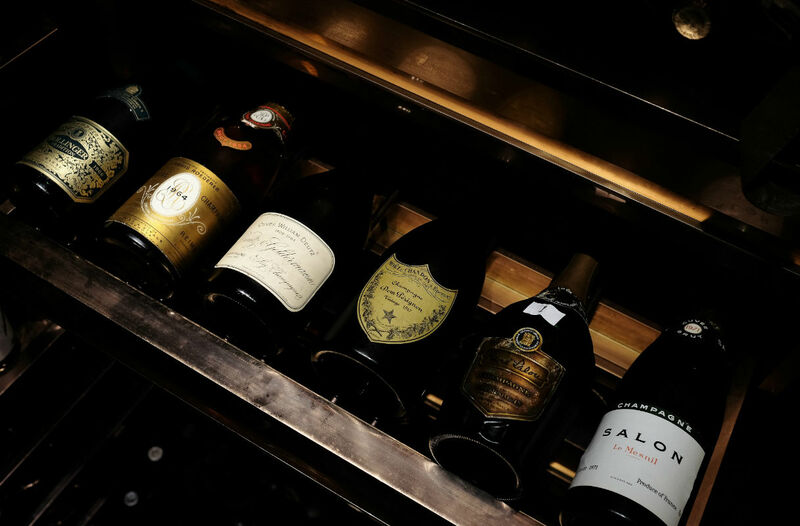 You might find here, for example, the highly exceptional Bruno Paillard “Première Cuvée” Extra-Brut or the highly underrated Charles Heidsieck “Brut Reserve” NV, either of which is good for any evening. Then’s the Le Terroir, which showcases individual expressions of each of the 17 Grand Crus of Champagne, and the single village releases that convey the subtle nuances of their diverse terroir. Perhaps you’d like a little taste of Bouzy – a Grand Cru village in the Montaigne de Reims subregion of Champagne – with the Duval-Leroy “Authentis Bouzy” Blanc de Noirs Brut Nature; or you prefer to sample terroir of Aÿ in the Vallée de la Marne through a glass of Philliponnat “Le Léon” Blanc de Noirs Extra-Brut, a grower Champagne too no less. For those with a little bit more spending power may want to peruse the section that is La Prestige, which is a compilation of Champagnes from some of the most iconic Champagne houses, a number of which hails from the Parkview Family Cellar. You’ll find the likes of Krug here; there’s the Krug “Clos du Mesnil” Grand Cru Blanc de Blancs and Krug “Clos d’Ambonnay” Grand Cru Blanc de Noirs both spanning a number of vintages, as well as the Bollinger La Grande Année from Aÿ-based Champagne house (Atlas even carries the highly sought-after Bollinger “Récemment Dégorgé (R.D. )” Extra Brut (Silver Jubilee Edition). There’s also the Les Collections, which comprises a number of exceptionally rare selection of Champagnes sold as a complete set that’s exclusive to Atlas. You’ll find the likes of the Taittinger Collection Series or the Jacques Selosse Lieux-Dits Collection; price is upon asking. But if you think purchasing one of those sets will tear a black hole in the fabric of your financial reality, the jewel in the crown of the Atlas’ Champagne collection is one that mere mortals are not worthy to behold, much less able to afford. That’s the affectionately named ‘Shipwreck Champagne’, a Heidsieck Monople & Co “Gout Americain” from 1907 that was salvaged from a sunken Swedish smuggling boat off the Finnish coast. It’s also exactly the same Champagne label served on The Titanic and fancied by Tsar Nicolas II, the last emperor of Russia, so you might understand why this bottle stands at the pinnacle of their collection at a price of $190,700 per bottle. 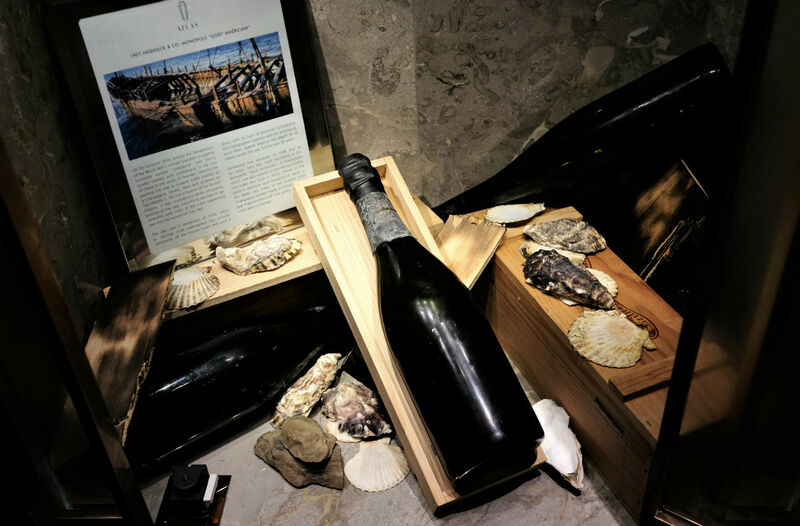 For wine enthusiasts though what’s also rather interesting about Atlas’ Champagne collection is not what’s bubbly, but what’s not bubbly – Atlas has been offering a curated selection of Coteaux Champenois and Ratafia de Champagne. If you’re not familiar with those we can’t blame you; still red wines and fortified wines from the region are rare outside of Champagne. The collection currently includes around 15 different Coteaux Champenois, from the very premium Egly Ouriet Ambonnay Grand Cru Rouge to the Lanson Bouzy Grand Cru Rouge; there’s currently also 5 Ratafia de Champagne from various Champagne houses. 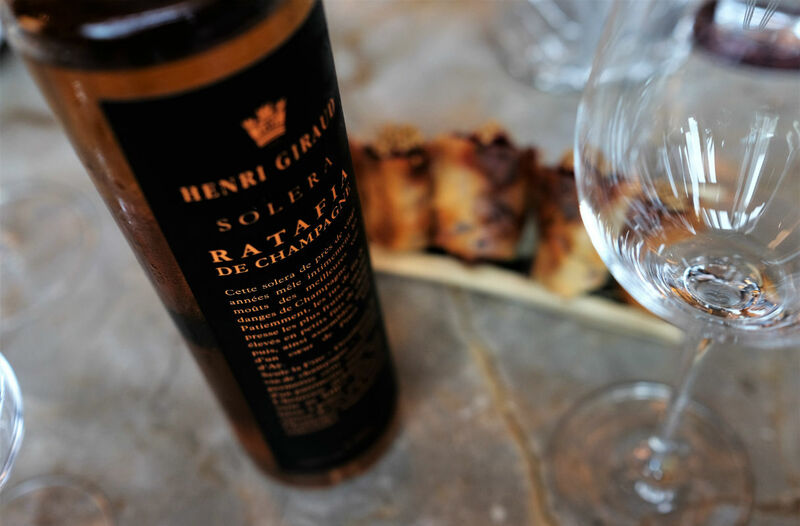 Both Cheung and Ng are working to source for more and hope to have more than 20 Coteaux Champenois and 10 Ratafia de Champagne by mid 2018. So sure, by all means visit Atlas for the grandeur that’s its sprawling opulent lobby or the jaw-dropping collection of gins. But whether you want to experience Champagne across vintage, terroir, or wine styles, you’ll find that Atlas’ Champagne collection will hold up.